The prefecture tries to fully coordinate its excellent combination of essential productive resources such as coal, electricity and water. The Guizhou government has announced its intention to make Guiyang, Gui’an New District and Qianxinan the data industrial base for the province. To develop a highly efficient modern mountainous agriculture with organic standards, the prefecture needs to take full advantage of its unique advantages in water, mountain and air quality. With natural ecological advantages including biological resources, Qianxinan Prefecture hopes to develop a health industry focused on treatment, recovery, protection and management. 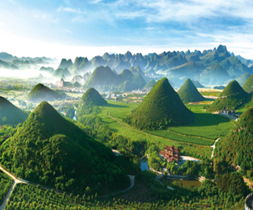 In October 2015, the 1st International Mountain Tourism Conference was held in Qianxinan prefecture, Guizhou province. One September of this year, the 2016 International Mountain Tourism & Outdoor Sport Conference opened in Qianxinan.